Happy NEW YEAR - ART FANS!!! We're back from the brink and we got pictures! After more than a year of preparation and fund-raising, months of pre-production, casting, set-building, tears, and excitement we finally got to the point of SHOOTING our film! 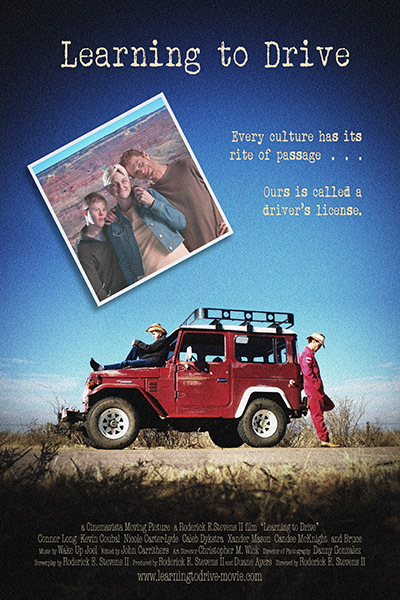 For six exhausting, difficult, but ultimately rewarding days a cast and crew of 25+ gathered in Southeastern Arizona to help bring this story to life and it was nothing short of magical. The amount of passion and support that's been offered up for this project is truly humbling. (right) The latest manifestation of the LTD poster! 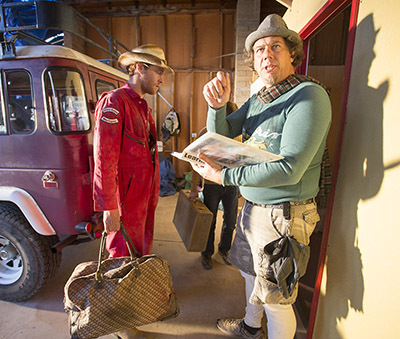 (below) Cinematographer, Danny Gonzalez and Director Roderick E. Stevens II go over the 'Motel Room' scene. 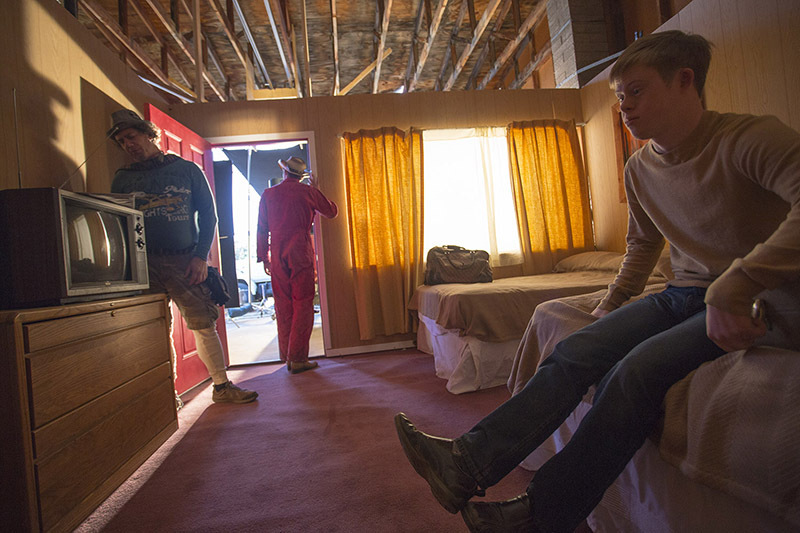 We spent several weeks building and dressing a motel room set in co-producer (and 2nd A.C.) Duane Ayer's hay barn. Building our own set gave us the flexibility we needed to capture some great shots of the actors by moving walls around and even taking them completely out when necessary. (left) Actors Xander Mason and Caleb Dykstra (our Young Red and Young Michael) hang out in the back of Bruce (our hero car). Caleb was ENAMORED with that car and loved sitting in the back of it. (below) Connor Long (our Michael) sits in the motel room set preparing for his big seen with Kevin Coubal (Red) at the door. Over the course of these first three days I found myself getting quite emotional as I watched these excellent actors bringing the LTD characters to life in ways that exceeded my hopes. I did not write an overly dramatic screenplay, in fact it is riddled with humor so in fact my emotions often stirred as a result of them making me laugh. Conversely, when we shot this motel room scene in which the brother's conflict reaches full boil, I was so consumed with the technicalities of capturing the scene that I hadn't noticed until a few takes in that there was nary a dry eye in the studio. 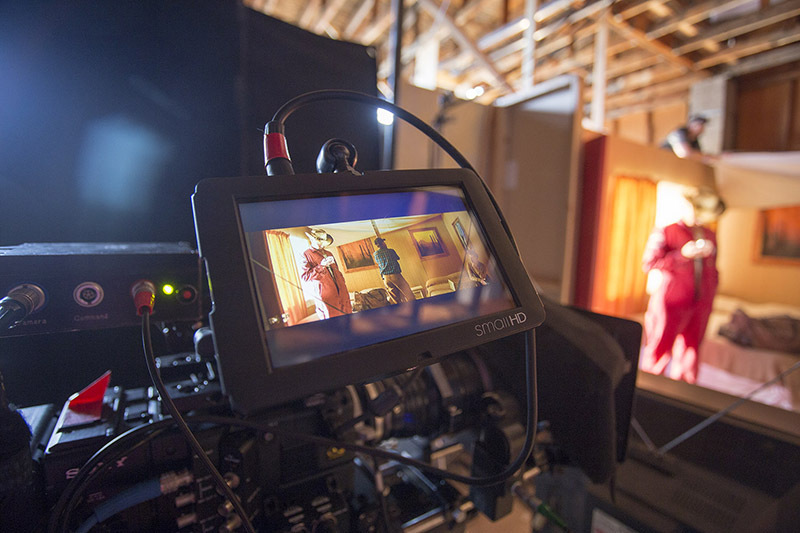 (above) Kevin Coubal playing Red prepares for the Motel Room scene as the crew puts the finishing touches on the set and lighting. 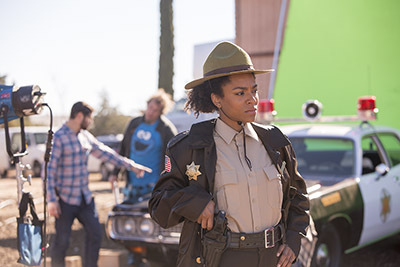 (right) Actress Nicole Carter-Lyde jumped into her role as Officer Zalena with both feet! Here she prepares to tell Red what's what. In the background, that's cinematographer Danny Gonzalez going over the scene with me (in my Cookie Monster pajamas for the day). 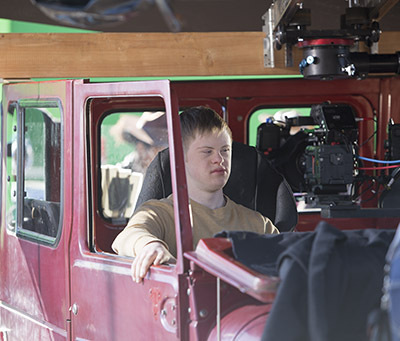 (below) Our precious Caleb (Young Michael) ROCKS the tractor for us! 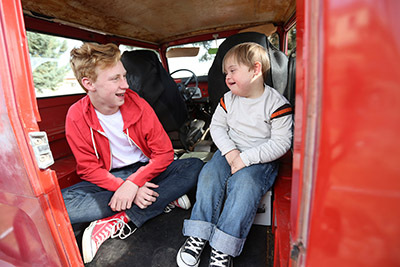 How fortunate for us that little Caleb is as obsessed with driving and cars as our 'character' Michael. This little guy is a tornado of energy and my life is all the better for knowing him. (above) Our "Quad Rig". 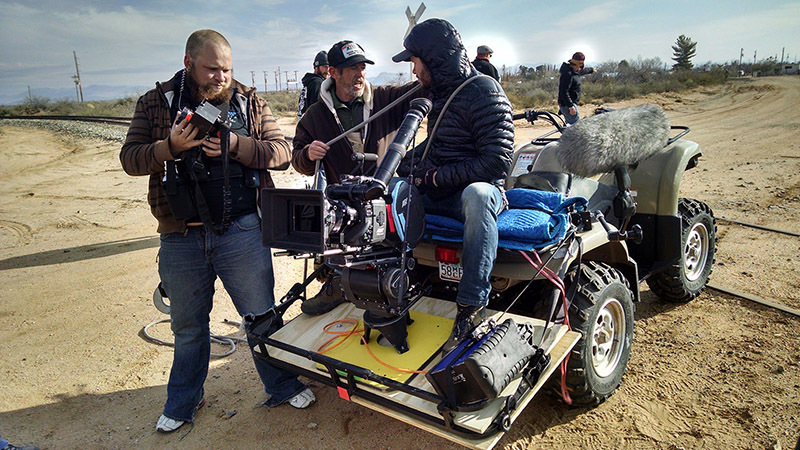 For a climactic scene which finds Red running hard down a dirt road to meet his brother Michael, we mounted the camera on this ATV so we could could lead him. Roderick Jr. was the driver for the shot and clocked Kevin (our actor) sprinting at 18 mph. 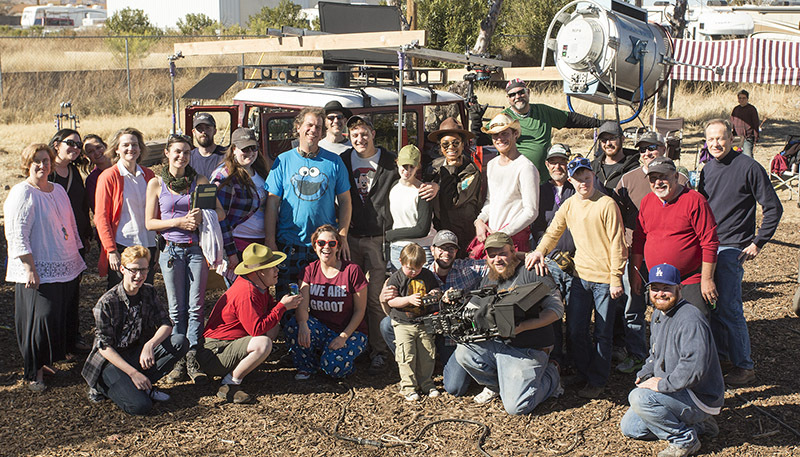 (below) The majority of the cast and crew for Learning to Drive pauses for a group photo during the shoot. (lower right) I'm directing "the arrival" at the motel. While much of the movie was shot in the 4K Raw Digital Cinema format via a Sony F55, some parts of it have been shot on 35mm motion picture film and some on Super 8 (remember that?) and those require labwork (processing) and datacine (transfer of the filmed images to an editable, digital format). This will cost us about $1,800 and until we can do that, we're not entirely clear what we have. To help make this film possible, once we wrapped I got REAL BUSY in the studio making new Drizzlescapes to show at next week's Tubac Festival of the Arts in Tubac, Arizona. I'll take 20% off the price AND include shipping to get it to you! (above) - First up is this latest piece titled "Curious Birds"! This 18"X24" Drizzlescape includes THREE layers of enamel paints and found imagery layered in a custom frame. 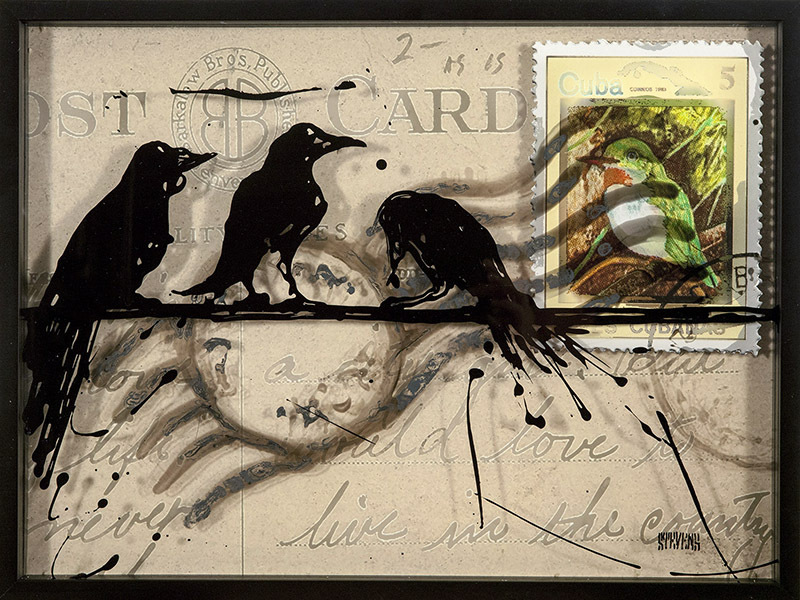 While it's hard to discern in this 2D photograph, the postage stamp and translucent postmark are suspended on the middle layer, floating over the postcard background. I thought I'd show this one off first as it's been met with an enthusiastic reception on Facebook! :-D This piece sells for $750, but can be yours for $600 INCLUDING SHIPPING if purchased prior to my show in Tubac starting next Tuesday - Feb 4th! :-D AND don't forget, you can get a tax-deduction for making the purchase now as we continue raising funds to complete "Learning to Drive"! 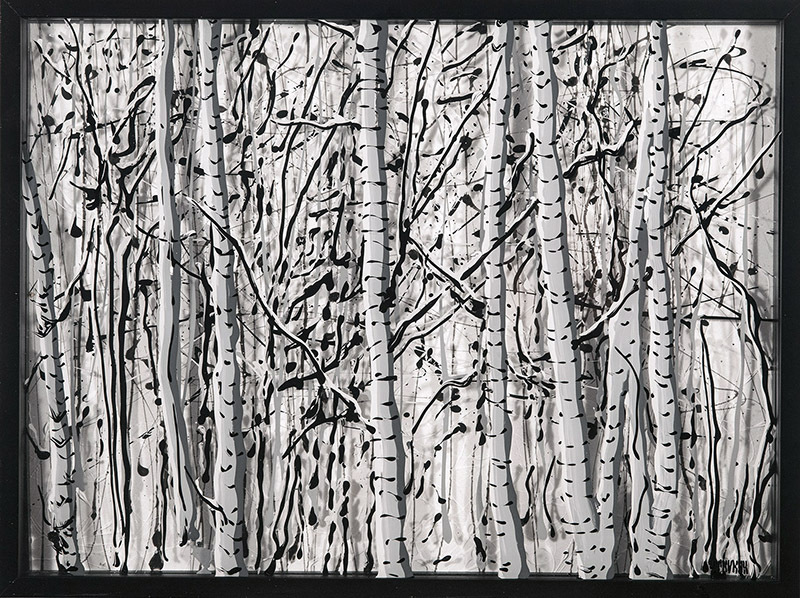 (below) - Another in the exciting aspen tree series - this is "Winter Aspens" is also 18"x24" and again consists of three layers of enamel paints drizzled onto clear acrylic sheets and wood panel. Each layer is separated by a space inside the custom frame, creating a depth and dimension unique to these Drizzlescapes! These are like 3D art - and honestly these 2D photographs do not do them justice. This particular image is inspired by the same photograph (taken by friend and filmmaker Josh Greer) that inspired the photo-realism aspen triptych you may recall from a couple of years ago. This piece is also priced at $750. And lastly - I bring you "Fall Floor"! 18"x24" Drizzlescape (below). 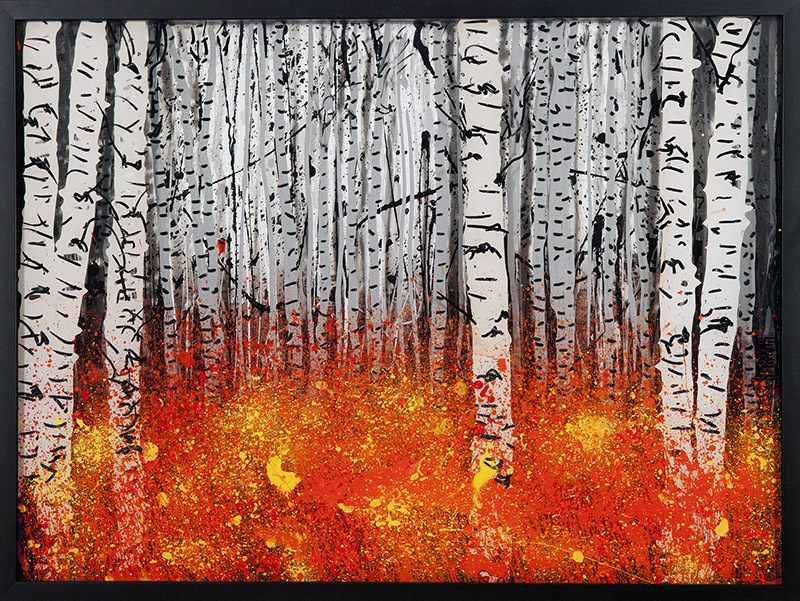 Another with three layers of trees and the fire-bright leaves of fall drizzled onto clear acrylic and wood panel. I love the stark contrast of the monochromatic trees with the vibrant fallen leaves! $750. If you MUST have this new one of a kind painting (or any others herein) and would like to purchase it before I set up my next show in Tubac, Arizona - just let me know and it's yours for 20% OFF and FREE SHIPPING!!! !